Comparative Politics: Domestic Responses to Global Challenges 9 Edition Balancing theory with application and featuring an engaging, student-friendly writing style, the Ninth Edition of COMPARATIVE POLITICS uses a unique theme-Domestic Responses to Global Challenges-to introduce key concepts and examine the growing interdependence of strong and weak states. COMPARATIVE POLITICS takes an in-depth look at ten countries and the European Union, framed within broader discussions in the part-opening chapters on Industrialized Democracies, Current and Former Communist Regimes, and The Global South. The introduction establishes a comparative structure based on five themes: conflict, democratization, economic liberalization, globalization, and challenges, which are then explored for each country. The countries discussed are categorized by economic development, helping students hone their skills of comparison, synthesis, and interpretation by studying countries of similar economic status. 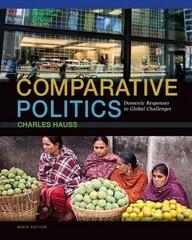 With this uniquely effective text, students can gain an understanding of important political trends and concepts, an exposure to politics in a number of countries, and a desire to dig more deeply into the fascinating field of comparative politics.